30 December 2010 - Warren Wright recently had an opportunity to visit the South Africa Air Force (SAAF) Museum at Swartkop AFB. He has sent a few images of the aircraft, weapons, and other Mirage and Cheetah related items on display at the museum. 24 December 2010 - May you and your loved ones enjoy the true meaning of Christmas and have a prosperous New Year. Let's all give thanks for what we have and pray for a more peaceful year in 2011. 21 December 2010 - Antonio Diaz had released another repaint for both the Mirage F1CE and the Mirage IIIEE in Ejército d'Aire service. These are textures only so you will need the Mirage F1 by Kirk Olsson and the Mirage III by J.E.Narcizo. After inspection these IIIEE textures are the original work of Jens-Ole Kjølberg for the Mark Harper Mirage III. They have been copied and applied to this model without requesting permission or giving credit. 18 December 2010 - Mark Harper has announced that he is completely re-working the virtual cockpit and improving the exterior models of the Mirage III/5 series originally available through Skysim. His goal is to make this the "ultimate" Mirage set. More information is available on his website. 14 December 2010 - Johan Jacobs (aka Jakes) of JDSModels in South Africa has released a new Atlas Cheetah D for FS2004 and FSX. Two schemes by Brent Best are included. Several external loads designed around two basic configurations, clean and with drop tanks, are included. A new instrument panel and gauges by Thinus Pretorius are also included. 11 December 2010 - Antonio Diaz has released four texture sets for the Mirage F1 by Kirk Olssen. The base F1M textures are those by Pablo Diaz. Included are the 2009 NATO Tiger Meet, 2008 NATO Ocean-Tiger Meet, Don Quixote 400th Anniversary, and the 2006 Tactical Leadership Programme scheme. All four aircraft are stationed at Albacete - Los Llanos AB. 2 December 2010 - I put up the annual Holiday Season's Greeting on the Home page. I found a nice winter looking image of a IAI Finger in Argentina. 30 November 2010 - An update to the beta version of the Étendard IVM by the Royale French Navy Design team has been released. This update includes, among other additions, revised VC external views and a new soundset. A mission pack to use the PHI is also available. 28 November 2010 - Geoffrey de Kergariou has painted a new set of textures for the Étendard of the Royale French Navy Design. The textures represent an Étendard IVM of Flotille 15F. Only the textures are included so you will need to download the Étendard IVM. 24 November 2010 - Aaron Haase has painted three new textures for the AI Mirage 2000C and 2000D of Fernando Martinez. The textures represent aircraft in special markings from the 2004 and 2010 NATO Tiger Meets. Only the textures are included so you will also need the base Mirage 2000C and Mirage 2000D aircraft. 20 November 2010 - Antonio Diaz has painted a set of photoreal textures for a Mirage IIIEE of the Spanish Ejército d'Aire. The file set includes textures only so you will also need the Mirage IIIE by Patrice Grange. 18 November 2010 - While doing some website maintenance I found that over 1/3 of the aircraft under the section "Other Mirage" were Étendards. So I have seperated them out and given the Étendard it's own section. 11 November 2010 - A while back Michel Gérard sent me many photos taken while he was with the Armee de l'Air. I add them to the website from time to time. This latest set is of a Mirage IIID trainer and the description is of the final few minutes of a training flight with a new Libyan Air Force pilot in the summer of 1977. 22 October 2010 - A beta version of the Etendard IVM has been released by the Royale French Navy Design team. This version is limited to one external configuration (wing tanks) and the four texture sets shown on my earlier preview page. 16 October 2010 - Patrice Grange has released a new version of his Mirage IIIB. New textures are included for the "Last Flight" IIIB-RV but the update is not limited to just that. He has included a new enhanced virtual cockpit, a reworked model with new features, animations, and four configurations. 5 October 2010 - I have had the opportunity to view the upcoming Etendard IVM by Royale French Navy Design for FSX. I have put together a page of information and will update it as new information becomes available. 14 September 2010 - Nick Black sent some images and information on the soon to be released Rafale AI project. I have put together a preview page to share them. As more information becomes available I will add it. 9.11.2001 11 September 2010 - It is hard to believe it was nine years ago today. So much was lost that day and in the years that have followed. 26 August 2010 - This past January Nick Black let me have a look at a Rafale AI project he was working on with MAIW. Needless to say after viewing and flying it I was very excited. Earlier this month Nick released a video to publicly announce his Armée de l'Air/Aéronavale Rafale AI project. 18 August 2010 - Patrice Grange has made a new Mirage IIIB for FS2004 and FSX. Two schemes (bare metal and Bicentenaire Revolution) and configurations (clean and armed) are included as well as a 2D instrument panel and a virtual cockpit. 7 August 2010 - Nick Black and MAIW have released the seventh and final in their series of French Armée de l'Air Mirage 2000 equipped air bases. This release covers the various Mirage 2000 units stationed at Mont de Marsan AB (LFBM), Cazaux AB (LFBC), and Djibouti (HFFF). To add to the flights in French air space and increase traffic at the Mirage air bases, Nick Black and MAIW have released a new AI package covering the transport aircraft of the Armée de l'Air. Scenery is included for Évreux-Fauville AB (LFOE), Orléans–Bricy AB (LFOJ), and Metz-Frescaty AB (LFSF). 23 July 2010 - André Chancel and the folks at Restauravia have released a new Dassault Mystère IVA for both FS9 and FSX. External configurations include clean (Patrouille de France) and wing tanks (four Armée de l'Air and four Israel Air Force). A 2D instrument panel and 3D virtual cockpit are included as well as flight models for both the Verdon and Tay engines. 17 July 2010 - I have had the opportunity to view the upcoming Rafale M by "Thor's Hammer" for FSX. Even with much work to be done on the cockpit and flight model it is really a beautiful aircraft to view in flight. I have put together a page of information and will update it as new information becomes available. 13 July 2010 - Vladimir Levkov has repainted the Skysim Mirage III/5 in the fictional colors of a Mirage IIIS in Yugoslav Air Force markings. Only the textures are included so you will also need the base package. 8 July 2010 - Nick Black and MAIW have released the sixth in their series of French Armée de l'Air Mirage 2000 equipped air bases. This release covers the Mirage 2000N of EC 3/4 "Limousin" stationed at Istres/Le Tubé AB (LFMI). Istres is not only an Armée de l'Air base, but also the home of the French test pilot school (EPNER - Ecole du Personnel Navigant d'Essais et de Réception), and it houses both a government flight test establishment and Dassault's private flight test center. Its 5000 meter runway can accomodate the Space Shuttle in the event of a diversion. 5 July 2010 - While visiting the Royal French Navy website of Sonny I found a few Base Aéronavale (BAN) sceneries by Tony Mézières I had not seen before. These included Landivisiau BAN (LFRJ), Lorient Lann-Bihoué BAN (LFRH), Nîmes Garons BAN (LFTW), and Hyères Le Palyvestre BAN (LFTH). These are all for FSX and include static military aircraft by Sylvain Parouty. 29 June 2010 - Zsolt Beleznay is at it again with another set of textures for the Skysim Mirage III/5. This latest release depicts a Mirage IIIS assigned to Fliegerstaffel 16 of the Swiss Air Force. The aircraft is textured in the original bare metal scheme of the 1970s. Only the textures are included so you will also need the base package. 26 June 2010 - Martial Feron has repainted the Super Etendard Modernisé of Romain Lucas in a special white tiger scheme worn by 11F Flotille at the NATO Arctic Tiger 2007 event. Only the textures are included so you will also need to download the SEM. 22 June 2010 - Nick Black and MAIW have released the fifth in their series of French Armée de l'Air Mirage 2000 equipped air bases. This release covers the Mirage 2000N of EC 1/4 "Dauphiné" and EC 2/4 "La Fayette" stationed at Luxeuil-St Sauveur AB (LFSX). 20 June 2010 - After researching more Zsolt Beleznay sent me a revised fin texture for his overall gray Mirage IIIEA of the Fuerza Aérea Argentina. The commemorative badge on the tail should have been for the 30th FAA Anniversary (2002) of the Fuerza Aérea Argentina. He has painted it as it appears today, faded on the left side and removed on the right side. 16 June 2010 - Zsolt Beleznay has painted a new set of textures for the Skysim Mirage III/5 package. The texture set represents a Mirage M5MA "Elkan" of the Fuerza Aérea de Chile. Only the textures are included so you will also need the base package. 11 June 2010 - Nick Black and MAIW have released the fourth in their series of French Armée de l'Air Mirage 2000 equipped air bases. This release covers the Mirage 2000D of EC 1/3 "Navarre", EC 2/3 "Champagne", and EC 3/3 "Ardennes" stationed at Nancy-Ochey Air Base (LFSO). 9 June 2010 - The latest repaint of the Skysim Mirage III by Zsolt Beleznay is an Armee de l'Air Mirage IIIC painted up in the sand and chestnut colors worn by the Mirage IIIC's of E.C. 3/10 "Vexin" over the skys of Djibouti. 5 June 2010 - Two new textures from Zsolt Beleznay are available for the Skysim Mirage III. Both are of aircraft operated by the Fuerza Aérea Argentina. The first is a Mirage IIIEA in camouflage from the 1980s. The second is of a IAI "Finger" or Mirage 5P "Mara" with a more recent scheme of blue upper surfaces. This should actually be a Mirage IIIEA. 29 May 2010 - Zsolt Beleznay has been busy painting new textures for the Skysim Mirage III. He has also been adding weathering to his textures. The first is of an overall gray Mirage IIIEA of the Fuerza Aérea Argentina wearing "Vuelo Solo 2010" commemorative badges on the tail. 26 May 2010 - Marc Oberholzer of Switzerland has repainted the Skysim Mirage III/5 in the colors of a Mirage IIIRS. Represented is R-2118 "Mata Hari" which was the last of a total of 18 recce Mirages to be put in service with the Swiss Air Force. 22 May 2010 - Zsolt Beleznay has finished a repaint for the Mirage IIIS of Beat Schaffner. An Aggressor scheme from the Swiss Air Force is represented. 15 May 2010 - Chris A Brown and Menno van den Boogaard have released a new FS2004 scenery for the Belgium airbases of Beauvechain (EBBE), Kleine Brogel (EBBL), and Florennes (EBFS). 9 May 2010 - Zsolt Beleznay has repainted the Mirage IIIS of Beat Schaffner in the colors of Swiss Air Force Fliegerstaffel (FlSt) 16 "Gold". Only the textures are included so you will also need the base package. 6 May 2010 - Dale Ashcroft has released a new FS2004 scenery for the Egyptian Air Force base of Gebel El Basur (HE0T). The scenery uses elements from MAIW and works perfectly with the flight plans of Giacomo Gramazio. 4 May 2010 - Giacomo Gramazio has created flight plans for the Mirage 2000 operating in the air forces of the Republic of China (Taiwan), Egypt, United Arab Emirates (UAE), and Qatar. The flight plans are intended for use with the AI Mirage 2000 series by Fernando Martinez combined with the textures by Michael Pearson. I have packaged them with complete installation instructions. 30 April 2010 - Nick Black and MAIW have released the third in their series of French Armée de l'Air Mirage 2000 equipped air bases. This release covers EC 2/5 'Ile de France' stationed at Orange-Caritat Air Base (LFMO). 21 April 2010 - Michel Gérard has sent another article and photos about the Mirage. This one is about the special flight suits worn by the Mirage III pilots when flying the aircraft equiped with the SEPR 844 rocket. 18 April 2010 - Nick Black and MAIW have released the second in their series of French Armée de l'Air Mirage 2000 equipped air bases. This release covers EC 1/12 "Cambrésis" stationed at Cambrai-Epinoy Air Base (LFQI). 17 April 2010 - Beat Schaffner has released two patches for his Mirage IIIS beta to improve frame rates. The patches are available on his website. You can also find information on using the Radar Warning Receiver (RWR) and how to shoot the Sidewinder missile. 13 April 2010 - As many know, Beat "Isra" Schaffner of Switzerland has been working on a Swiss Air Force Mirage IIIS for FS2004. The airframe is based on the Mirage III by Warwick "Wossa" Carter and has been extensively reworked to include the external differences of the Mirage IIIS. The cockpit has also been reworked to look and work like the very unique cockpit of the Mirage IIIS. The aircraft is still under development but a Beta Release is being offered at this time. Please send your feedback to Isra. 9 April 2010 - Zsolt Beleznay has painted two more texture sets for the Mirage F1 by Kirk Olsson. They represents the Mirage F1CJ of the Royal Jordanian Air Force. Only the textures are included so you will also need the base package. 7 April 2010 - Nick Black wrote me last week to say that he is doing a series of seven scenery packages covering all air bases where the Armée de l'Air Mirage 2000 operates. For more information and a complete list of the packages go here. The first package covering Dijon-Longvic AB (LFSD) and Al Dhafra AB, UAE (OMAM) has now been released. 25 March 2010 - A repaint group know as Partnership Paints has made a set of textures for the Mirage IIIE of Italo D'Attomo and Giovanni Quai. The textures represent a fictitious Peerhoven Air Virtual Airline. 19 March 2010 - Zsolt Beleznay has painted two new sets of textures for the Skysim Mirage III/5 package. The first represents a Mirage 5BR of the Belgium Air Force with special 30th Anniversary markings for 42 Squadron. The second texture set represents a "Shahak" of the Israel Air Force. This should be a Mirage IIIC but Zolt has painted the textures for use with the IAI Nesher. Only the textures are included so you will also need the base package. 13 March 2010 - I was made aware of the full length version of Lionel Charlet's film "Vols Blancs" on YouTube. If you haven't seen this Mirage III tribute you will enjoy it. It is broken into four parts beginning here. Here are links to parts 2, 3, and 4. After watching perhaps you will want to go for a flight in a Mirage IIIDS? 5 March 2010 - Zsolt Beleznay has painted a new set of textures for the Skysim Mirage III/5 package. The texture set represents a Mirage 50CN "Pantera" of the Fuerza Aérea de Chile. Only the textures are included so you will also need the base package. 28 February 2010 - Patrice Grange has created a new package for his FS2004/FSX Mirage III. This one features textures for RAAF 75 Squadron to make it a Mirage IIIO. Three external models are included: clean, air-to-air, and ground attack. You will also need the previous Mirage IIIE package. 20 February 2010 - Michal Lubiscak has been working on updating the flight models of two more FS2004 aircraft of interest to this website. These include the Mirage F1 by Kirk Olsson and the Super Etendard by Romain Lucas. He has updated weights, flight dynamics, fuel tanks, engine parameters, contact points, and has simulated the effect of a deployed drag chute. 13 February 2009 - Edmundo Abad has repainted an older Mirage model in the colors of the Fuerza Aérea de Chile. He then adapted it for use with CFS1. The aircraft is Mirage 50CN Pantera. 9 February 2010 - Over the past year Michel Gérard has sent me many images of the Mirage in action from when he was an Intelligence Officer with the 2ème Escadre de Chasse at Dijon. This first group is from a four aircraft formation of the Mirage 2000 over Corsica and Italy in 1987. 31 January 2009 - Michal Lubiscak has updated the configuration file for the Mirage 2000N by Roland Laborie/Jonathan Hilaire. He has updated weights, flight dynamics, fuel tanks, engine parameters, contact points, and more. 24 January 2010 - Bob Chicilo has released an update for the Rafale C and M by Cyril Pioffet for use with FS9. The package updates the flight dynamics and instrument panel gauges. Since it is an update it requires the Rafale base aircraft. Several repaints are also available for this aircraft. 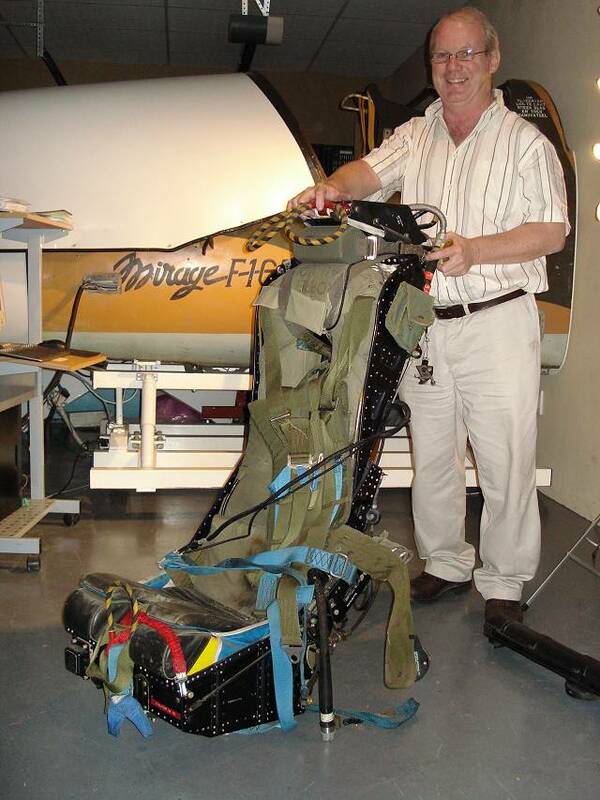 19 January 2010 - Peter Dooley wrote to say that he had good news regarding his Mirage F1CZ simulator. 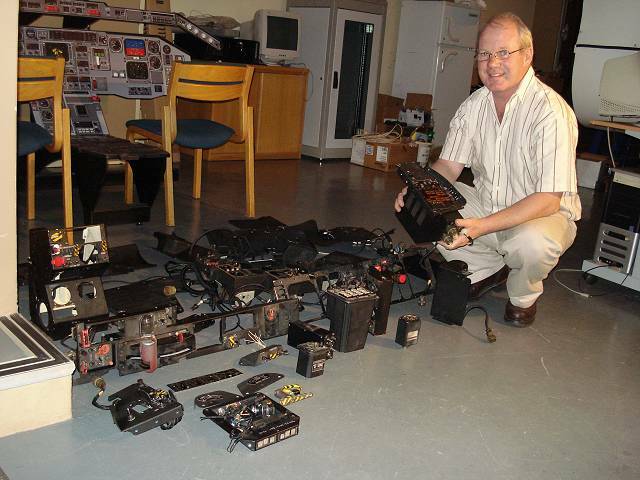 The SAAF invited him to come over to the local airbase and strip ALL the parts, switches, panels, and believe it or not, a complete intact Martin-Baker Mk 4 ejection seat for the F1CZ simulator he and his brother David built. The real thing!!! They also gave him the seat's 'gun' section with slides for mounting the seat into the cockpit. "Without the cartridges which is just as well as I don't need any holes in my ceiling." Peter said, "Those guys were so impressed with the work that I have done on my simulator so far that they decided to donate me anything that I was missing in my cockpit. Obviously, I will still use my 3D panel gauges (which I have upgraded to high resolution) and vastly improved air file, etc. Everything, including the TACAN and HUD with most of its proper modes, will work properly." "For safety and security reasons, the ejection seat was rendered unservicable prior to release and they also removed the entire firing mechanism, links, cables, cartridges, etc. All other components, although genuine parts, are factory modified simulator parts from Dassault and we have now further modified these to connect directly to the computer interfaces used in our commercially certified WX-400 range of full cockpit simulators." 14 January 2010 - Similar to the startup sequence and other videos he made for the Skysim Mirage III/5, MirageIII2009 has made a series of videos for the Mirage 2000 by Rollus13. 9 January 2010 - Gérard Finaltéri, Webmaster of Virtual Cors'Air, wrote to tell me he has a new URL address for his website and to let me know about a new scenery for my favorite French Air Base -- BA 126 Solenzara. 2010 is already starting out to be a great year. 1 January 2010 - Happy New Year!